She is an only child with no family. She was abandonned at birth and found hours later in an alley. She grew up in a care home in Sunset Valley, as she got older she knew her chances of being adopted got smaller, and now that she was 18 she has left Sunset Valley to begin her new life in Riverview. Due to having no family she dreams to have a huge one, with lots and lots of children. She is Friendly, She loves animals, and that might be obvious because her favourite jumper has a picture of a cat on it. She Loves family, despite the fact she never had one. Elizabeth is a major Flirt and hopefully this will help her to find a man…or woman! And although her new home may not be very big as long as it is neat and tidy, Lizzie doesnt mind. 4-I will follow the alphabetical name scheme where each child born into the family takes the next letter of the alphabet. 10-All generations will have the surname Simm and there will be 10 generations. I like your stories. My sim’s family name was originally Simms, pretty close to your sim’s name, but I changed it to Venture to fit my theme better. I’m such a cheater lol. Thank you. But tomorrow is tuesday? Your founder Sim is very pretty! Looking forward to your story! How do you have such good looking offspring? 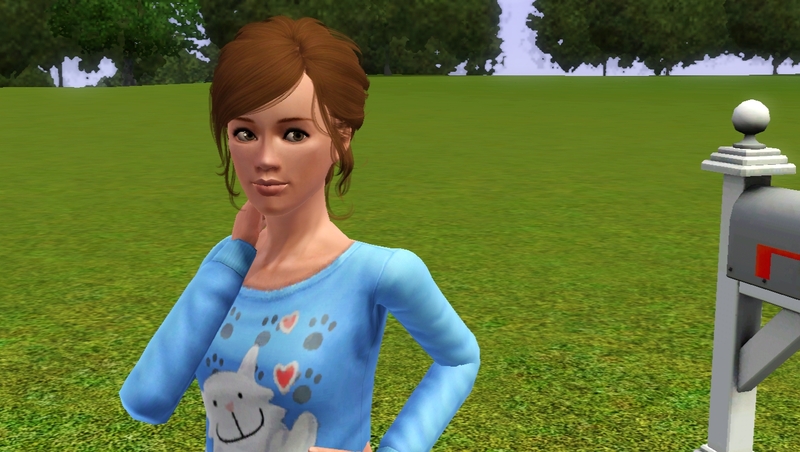 I always find attractive mates for my sims and somehow their kids are always ugly! Is there a way to change their appearance? I tried plastic surgery, HORRIBLE IDEA!! 😉 Thanks!